The City of Tampa Black History Committee, Inc. presents the 2018 Scholarship Awards Ceremony. Each year, rewards students for their scholastic achievements. Students are motivated to dream, achieve and grow while utilizing scholarship funds to obtain a degree from the university of their choice. Please join us in honoring Tampa Bay’s students for their scholastic achievements. For over two decades, the City of Tampa Black History Committee, Inc. (COTBHC) has recognized City of Tampa employees, supported local youth, and celebrated Tampa’s rich heritage. Now, we offer you the chance to make a positive impact on the Tampa Bay region through sponsorship of the 3rd Annual Golf Tournament. 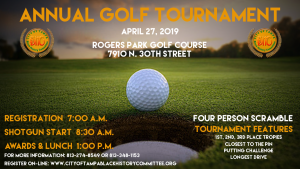 The 3rd Annual Golf Tournament will take place on April 28th at 8:30am at the Rogers Park Golf Course, located at 7910 North 30th Street, Tampa, FL 33610. This event supports the 2018 COTBHC Scholarship Awards in providing scholarships to outstanding high school graduates before they head off to the college or university of their choice. This event also offers a great opportunity for your organization to reach the Tampa Bay area with your brand and targeted message via the golf tournament. On behalf of the COTBHC, I thank you in advance for your financial support and look forward to greeting you at our 3rd Annual Golf Tournament. 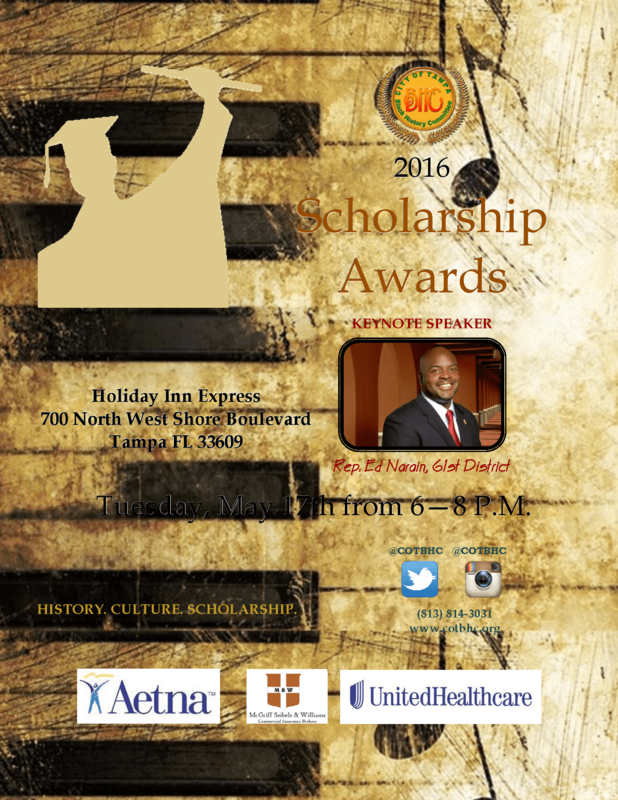 The City of Tampa Black History Committee, Inc. presents the 2016 Scholarship Awards Ceremony. We are honored to welcome Florida State Representative Ed Narain of the 61st District as our Keynote Speaker. Representative Narain is a dedicated member of the Tampa community who has served in various community and civic roles over the last nineteen years. Ed works has worked with several organizations that are committed to helping children and the working poor. He is a member of the Children’s Board of Hillsborough County, and served for several years on the Hillsborough County Head Start Policy Council and the Hillsborough County Community Action Board. Jeremy Frederique is a senior at Durant High School; he will be graduating with a 3.0 unweighted GPA. His intended major of study is Criminal Justice. He is a member of Durant High School’s Cougar Pride Marching Band, Air Force Junior R.O.T.C. and is a Hillsborough County Sheriff Office Explorer. Jeremy also has participated in the Gentlemen’s Quest Club and 100 Black Men. Both of these stellar organizations encourage young men to achieve excellence in their academic environment, community and family life. Jeremy gives back by volunteering at Mulrennan Middle School regularly as a tutor to band students and assisting with Hillsborough County’s HOST Program. A senior at Tampa Bay Technical High School, Taylor Harris is a Health Academy student who maintains a 4.0 GPA. Her intended major of study is Pharmacy. Taylor is an active member of her community and volunteers with Metropolitan Ministries and the Walking Tall Camp as a volunteer camp counselor. Taylor is an active member of Springhill Missionary Baptist Church, where she serves as the secretary for her church’s Teen Usher Ministry. Christine Forbes is a senior at Alonso High School, who will be graduating with a 3.8 unweighted GPA (top four percentile of the class). In the Fall, she will be attending Barnard College of Columbia University where her intended major will be Psychology with a minor in History. Christine is an accomplished dancer. She has studied for over twelve years, and mastered ballet, pointe, tap, modern and jazz. In the summer of 2012, she was selected to attend a dance intensive workshop with the Alvin Ailey Dance School. In the summer of 2014, she was selected to attend a Leadership Education and Development Summer Business Institute (LEAD) at the Kellogg School of Business at Northwestern University. At Alonso High School, she is a member of National Honor Society, Spanish National Honor Society and the Black Leaders Empowering Successful Scholars Club where she holds the treasurer position. Christine also volunteers with Youth-4-Truth Church and the Upper Tampa Bay Library Teen Advisory Board. She is a member of Bible Based Fellowship Church of Temple Terrace.